So … are they really that bad? Members of the U.S. Olympic team had some final opening ceremony uniform fittings with Ralph Lauren on Thursday, and a few athletes Tweeted photos from the proceedings. Oklahoma City Thunder star Kevin Durant shared a shot of himself and New York Knicks forward Carmelo Anthony, both in uniform (berets and all). 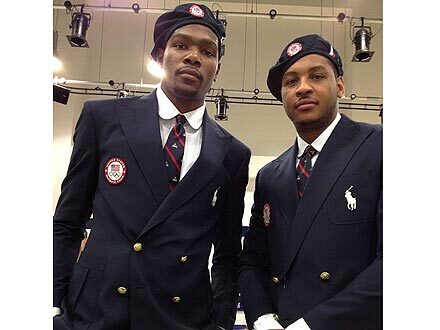 The guys definitely wear their suits well, and Durant’s followers had nothing but compliments for the Team U.S.A.-ers. The outfits feature navy blazers, crisp white shirts and ties, plus those “too-European” berets, all emblazoned with the American flag. So now that you’ve seen the uniforms, how do you feel? Tell us in the comments below! KEEP UP WITH ALL THE LATEST NEWS AND PHOTOS FROM THE GAMES!